"You are my enemy. And I am yours! You are everything I despise. The worst thing in all creation. I have defeated you time and time again. I have sent you back into the Void. I have saved the whole of reality from you. I am the Doctor and you are the Daleks!" 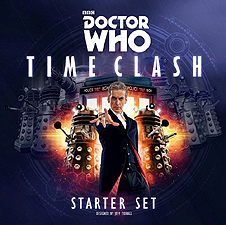 In Doctor Who Time Clash, the Doctor and the Daleks are locked in a desperate struggle for the fate of the universe itself. You'll play cards representing plans, threats, tech, and quips to stacks that represent the time of the struggle, the Doctor's companion, and the enemy's influence. The two sides also compete to control the Doctor's location, which activates or deactivates crucial powers. During the game's build-up segment, each side tries to establish an advantage. When the balance tips and the endgame comes, they press for victory. Either one of the Doctor's desperate gambits will succeed, or the Daleks' pressing threats will crush him!